When your air conditioning stops working, you want it back on quickly at a reasonable rate. For that reason, Staats Service provides air conditioning repair Peoria IL residents choose for fast service at upfront prices. 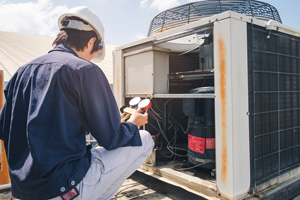 We respond whenever you need us and fix most major brand name HVAC systems. Furthermore, we let you know what the price will be at the start. We price by the job, not by the hour. So, you do not get disappointed by a larger bill than you anticipated when we complete the work. In order to work with the most-trusted name in the Tri-County area, call Staats Service at 309-694-9177 or contact us online today. Since you can never predict when your air conditioning will break, you need Staats Service. 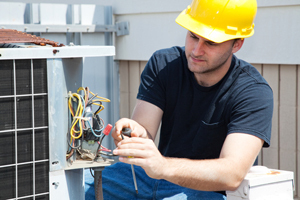 We provide the air conditioning repair Peoria IL locals call during emergencies. We respond with around-the-clock, emergency service to get your air conditioning working again. Do not sweat through a humid summer night, waiting for a repairman to come out during normal business hours. Call Staats Service at the first sign of trouble and get back to relaxing in a cool house quickly. Also, we come out at any time if your furnace goes out in the winter. We realize nobody wants to wait out a weather emergency. As a result, Staats Service responds promptly whenever you need us to fix what is wrong. Staats Service provides air conditioning repair Peoria IL customers find affordable as well as other services. In fact, we get washers, dryers, dishwashers, microwaves, refrigerators, ranges, ovens and other household appliances working again. Additionally, our services also include furnace and air conditioning sales and installation, custom sheet metal fabrication, electric heat, indoor air quality and thermostats. Staats Service provides fast air conditioning repair Peoria IL residents appreciate for the upfront price. Most importantly, we come out whenever you need us for emergency service. Call Staats Service now at 309-694-9177 or contact us online for affordable air conditioning repair. Are you searching for air conditioning repair outside of Peoria? That’s okay. Staats Service is located at 601 South Main Street in Creve Coeur. As a result, we are easily able to respond for service requests in East Peoria, Washington, Morton, Metamora, Pekin and other areas nearby.